The EXCITECAT 810 has a full pilot house which offers unobstructed visibility forward and panoramic views through the sliding main salon windows. Views aft are also clear, thanks to the sliding doors from the main salon to the cockpit, which also facilitate entry of people and gear. In addition to the ample aft cockpit on the EXCITECAT 810, the foredeck is large and flat enough to offer a generous sunbathing area. Both bows offer storage lockers, which are in addition to the separate anchor locker and fender / line locker. The accommodations of the EXCITECAT 810 are impressive for a boat of its size. 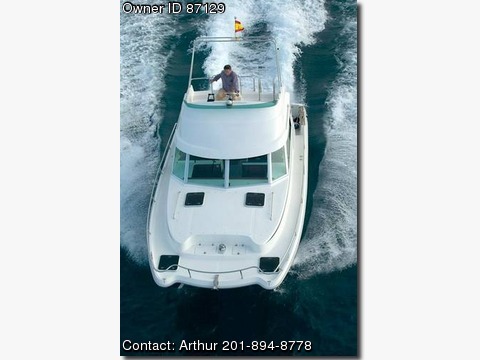 There is a full inside steering station and instrument area, a bright and open main salon with a convertible dining table and bench seating, a nicely equipped compact galley, two spacious private cabins with double beds, shelf storage and hanging locker space and a comfortable head & shower.